In my last post, we hiked the Murphy Point Overlook Trail to one of the most scenic views I have ever experienced. 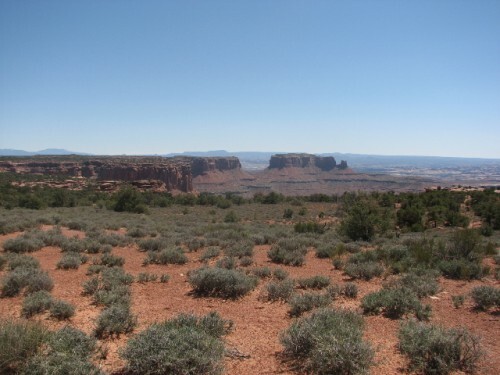 After that hike, we started back the way we came and parked at the trail head for Mesa Arch. Mesa Arch is one of the most visited places in the park, for a couple of reasons – it is only a 0.6 mile round trip hike from the trail head, and it is beautiful. Mesa Arch is one of the arches in this area that faces the sunrise, allowing photographers to get some beautiful sunrises coming up through the arch. 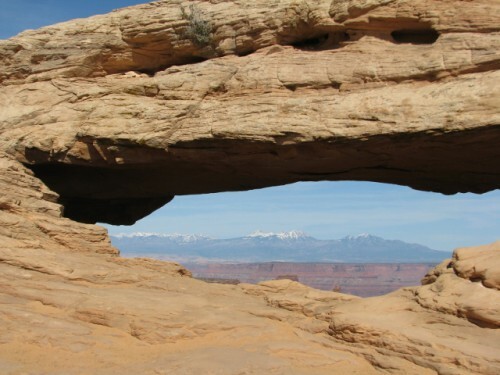 And it is perched right on the edge of the canyon, so you can get some amazing views of the canyon through the arch. 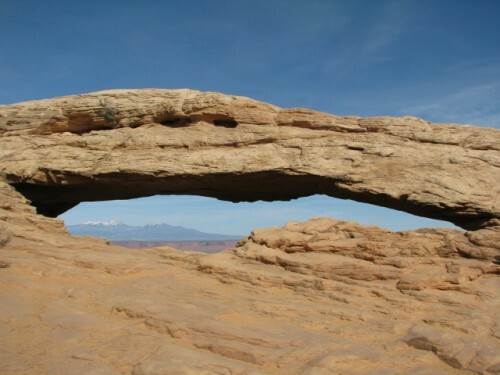 And if that weren’t enough, the picturesque La Sal Mountains can be seen in the distance through the arch. Even though we weren’t there at sunrise, the views of the canyon and the snow capped mountains in the background are stunning. Mesa Arch, and other arches in the area form when a solid block of sandstone gets cracks in it from pressure from the Earth’s forces. The cracks get water in them when it rains or snows, and the water makes the cracks expand. Over millions of years the water erodes the sandstone, causing fins to form, and then chunks of sandstone eventually fall away. If the sandstone beneath falls away and leaves the stone above, you have an arch! There were a lot more people at Mesa Arch than Murphy Point, but it wasn’t crowded, and everybody was really polite about taking turns so you could get a photo of the arch without anyone standing in it, or you standing next to the arch. I posed with the arch for a few photos, but of course Jon wouldn’t. All in all, it was a worthwhile short hike – I love the photos I took there. Once we finished our Mesa Arch hike it was a little after 5. We talked about whether we wanted to do more, and decided that 4.2 miles of hiking was enough for the day. We headed back towards the park exit, and Jon was nice enough to let me stop back at the Visitor’s Center on the way out and watch the movie that we skipped earlier. It is approximately 15 minutes about the history of settlement and the geology of the park and was pretty informative. 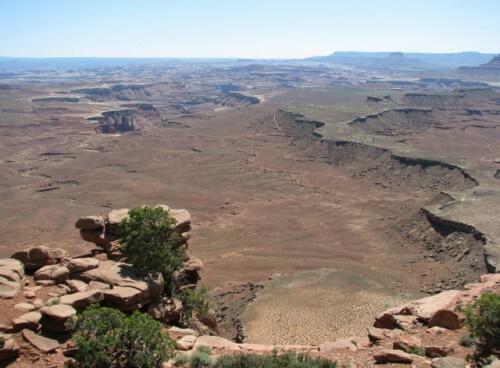 That’s when Jon and I learned that most of the roads in Canyonlands had been built to accommodate uranium mining in the 1950s! It was an interesting example of how industry can give a boost to recreation. After leaving Canyonlands, we drove back into Moab and checked into our home for the night – another Super 8 – and discovered it is the ritziest Super 8 I have ever seen! It had granite counter tops, a built in drawer system along one wall, and laminate “wood” floors. Of course, it was also the most expensive Super 8 I have ever seen – but it was still less expensive than the other hotels we had looked at. We did a quick change of clothes so we would be prepared for the temperature drop after sundown, and made our way to the Moab Brewery for a quick dinner before our astronomy tour! 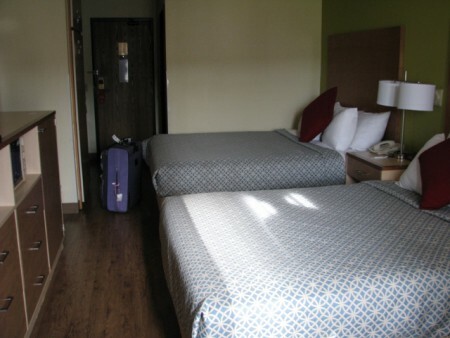 Super 8 with “wood” floors! There was a 10 minute wait at the Moab Brewery, but the wait went quickly and we were able to order quickly because we had looked at the menu while we waited. Jon got the fresh salmon filet – with a dinner salad, bread, vegetables and rice pilaf. He paired his with a Black Imperial Ale; he had been craving a high octane beer for the last few days, and this one delivered at 8.59% alcohol by volume. I can only guess that the Moab Brewery is able to brew extra strong beer either because it has a hard liquor license, or because this beer is not available on tap – it is served in the bottle. I had the Greek Pasta – sautéed sundried and fresh tomatoes, Kalamata olives & spinach in garlic, basil & olive oil, tossed with penne pasta, topped with feta cheese & parsley. It was served with garlic bread. I enjoyed it with a Dead Horse Amber Ale. The brewery was packed – the service was fast and friendly, and the décor was fun. The food wasn’t outstanding, but it was good. It was the kind of place we would love to come back to. But unfortunately we couldn’t linger long, because we had to meet our Astronomy tour guide! 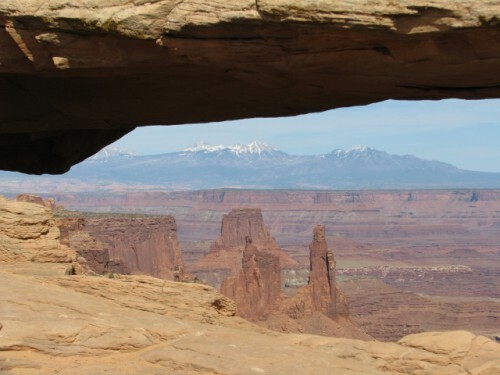 Have you ever hiked to Mesa Arch or visited the Moab Brewery? I’ll post about our Astronomy tour next! 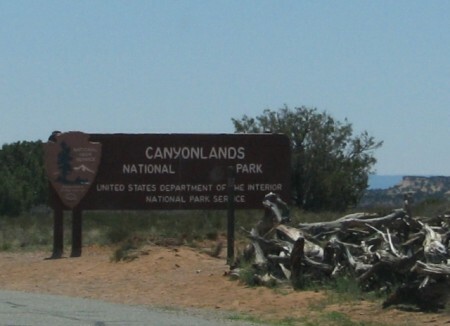 Like I said in my last post, Canyonlands is divided up into three sections, and we were soon at the Island in the Sky Visitor’s Center. I got my stamp – yay! Got my postcards – yay! And endured the good natured teasing from my husband about my nerdly pursuits – boo! There is a short movie about the park, but we wanted to get started on a hike, so we skipped it. First up on the list was the Murphy Point Overlook Trail. 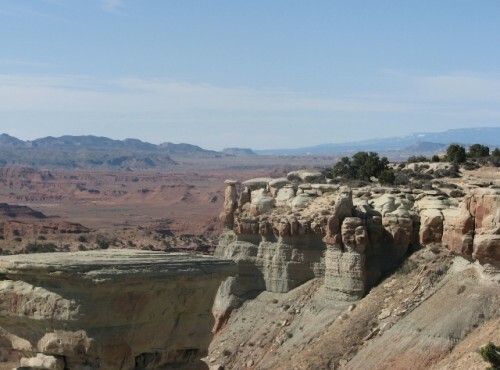 This trail is a 3.6 mile roundtrip out and back trail on gravel and slick rock sandstone. Apparently this trail used to be a road, but the Park Service turned it into a trail in 1996. I couldn’t tell. Surprisingly, this is one of the less popular hikes in the park. I suppose because others lead to something more “dramatic,” like the hikes that lead to an arch, or a crater, or a Puebloan site. But we were going to see arches at Arches NP, and Puebloan dwellings at Mesa Verde NP and Chaco Culture NHP, so this hike to see the less “dramatic” was perfect for us. 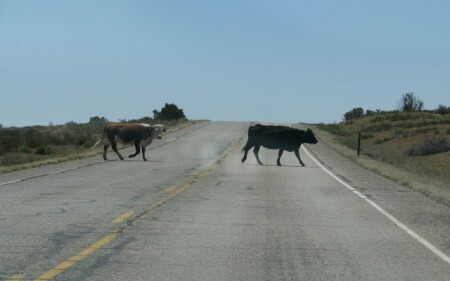 At the beginning of the trail you pass by the remains of a turn of the century ranch owned by the Murphy brothers, who grazed cattle on and below the point between 1916 and 1920. You see cattle chutes and old fencing from a bygone era. Then the trail is a sand and rocky trail in a slight depression for awhile. It changes to a slick rock surface as you hike further out. 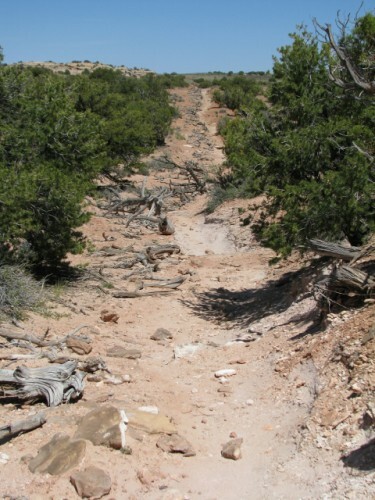 About halfway to the overlook, you have the option of breaking off onto the Murphy Trail, which takes you on a much longer trail to the Murphy Hogback and the Murphy Wash. The Murphy Trail also looked interesting, but at 9 miles it would have been a full day hike. The trail becomes a slick rock sandstone as you get closer to the overlook and the trails are marked with cairns – little piles of stacked rocks. After completing the mostly downhill 1.8 mile trip out to the Murphy Point Overlook, we were greeted with amazing views of Stillwater Canyon and the Green River. I feel like I have been using the word amazing a lot in this series of posts, but there is really no other way to describe it. Except maybe spectacular. Or stunning. Or perhaps awe inspiring… All those people who were looking for something more dramatic were really missing out! Looking down at Stillwater Canyon from the Murphy Point Overlook – the Green River is below. 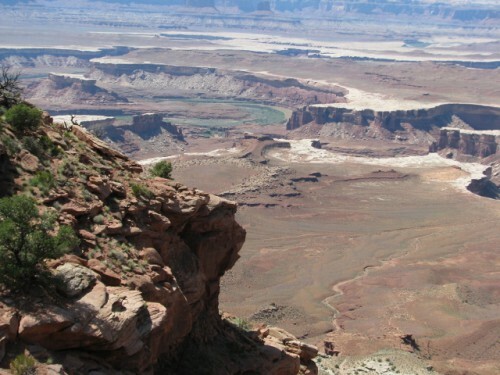 The canyon below has a ledge (the Murphy Hogback) where the White Rim Sandstone juts out into the canyon because it does not erode as quickly as the shales that made up the layers on top. I couldn’t find any information on how deep Stillwater Canyon is, but the National Park Service website has information on a few of the Murphy trails that seem to indicate that the Murphy Hogback is about 1,000 feet down, and the river is about 2,000 feet down. Wow. We hardly saw anybody on the whole hike – just three other couples the entire time, and we enjoyed sitting at the edge (not too close though) taking in the view. After being surrounded by people all day at Zion the day before, it was really nice to feel so alone! From the viewpoint, you can’t hear the road or anything artificial, so you can really just get lost in your own thoughts. I think this was one of Jon’s favorites hikes for the entire trip – and it was certainly one of mine. I even got Jon to pose for some selfies with me. The hike back was a bit more strenuous because the return trip is mostly uphill, but nothing too steep. What an awesome hike! 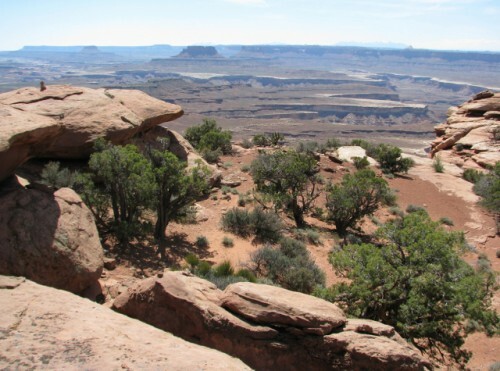 Have you ever hiked the Murphy Point Overlook Trail? What did you think? SW National Parks Trip: Cedar City to Moab! After hiking Zion National Park, the next morning we got up early again so we could make the drive to our next destination – Moab, Utah. Because our whole trip was just less than two weeks, we had to be selective about where we could visit and where we had to skip. But believe me, it was painful to drive past the signs for Bryce Canyon National Park and Capitol Reef National Park – they look spectacular too. I wish the power lines weren’t there, but I love how this hill shows its sedimentary layers so well! 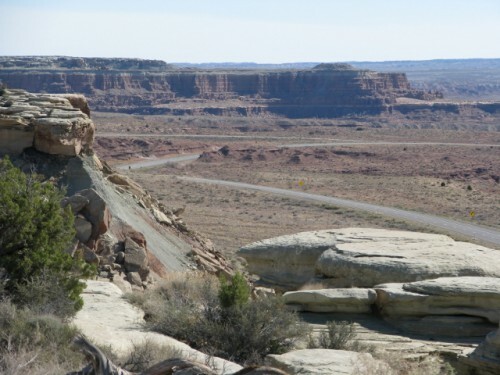 I was amazed at how pretty the drive was on I-70, the formations are stunning and gradually transition as you drive from rock formations with fantastic colors and sedimentary layers to scrub pine forests with rocky soils to mesas and plateaus. We stopped at a scenic viewpoint and rustic rest area (just a pit toilet) and found some amazing views of Castle Valley within the San Rafael Swell. It gets its name from the rock formations that look distinctively like… well… castles! I took lots of photos here because I was just so awestruck by the beauty of the place. Castle Valley is practically void of any population now, but apparently the area was the last place that Brigham Young called on his followers to settle, back in the 1870s. Due to the lack of water, it never really took off – only a few hardy cowboys took the risk of trying to live here; they used their knowledge of every hidden spring and water source to raise a small number of cattle. Today, other than the highway, there are no signs of human habitation as far as the eye can see. Back on the road, we made the rest of the journey to Moab, passing through a few small towns but overall, we were surprised by the lack of towns and services along such a major highway. We made great time though, and reached Moab in time for lunch. I had expected to have lunch on the road, so I wasn’t really prepared for a lunch restaurant in Moab – we parked downtown and walked around for a little while before settling on the Peace Tree Café. The Peace Tree had some great outdoor covered seating, and a wide selection of homemade smoothies and juices. But I was drawn to their Angus burger – I had it with chips, and Jon had a beet salad. 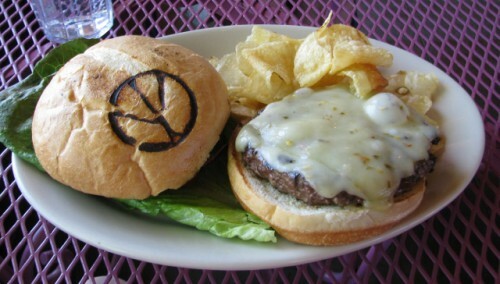 My burger came complete with a peace sign brand! 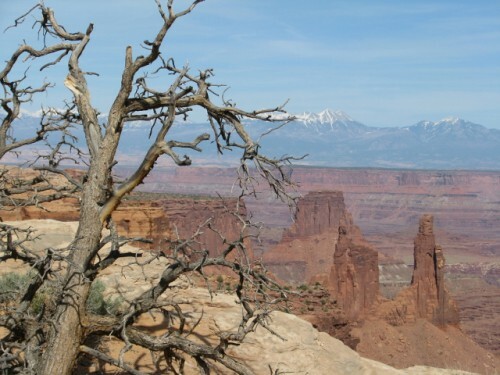 We ate quickly so we would have time to hike to our heart’s content, because our next stop was Canyonlands National Park! Have you ever driven this stretch of I-70 and stopped at the Castle Valley Viewpoint? What did you think? After we ate, we took some photos of the Zion Lodge. The original lodge was built in 1924 with milled lumber and stonework. It was intended to provide a rustic lodge look without being over the top in grandeur and overpowering the landscape. At the time, there were still several settlers with homes on the canyon floor. Several cabins were added in 1927, and 1929, and employee dormitories were built in the complex between 1929 and 1937. 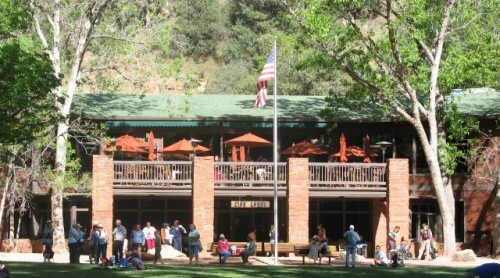 Unfortunately the original lodge burned in 1966 – a replacement was built immediately, but wasn’t remodeled to look like the original building until 1990. The cabins and dormitories are the originals. We still wanted to do a little more hiking so we checked out the Emerald Pools Trail next. There are 3 Emerald Pools – the first one is 0.6 miles out for a round trip of 1.2 miles. 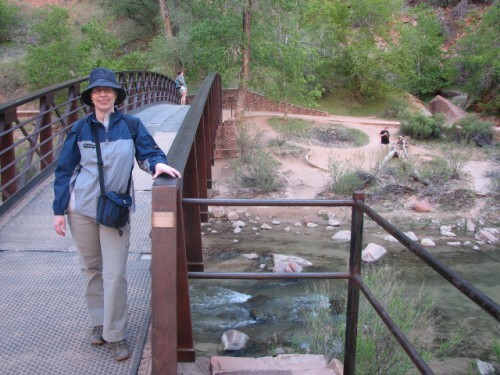 There is a footbridge that crosses over the Virgin River at the trail head, and a paved trail. There are some hills on this trail, but nothing too strenuous. We got to the pool and I promptly renamed it the Emerald Mud Puddle. I was not impressed – it was not the right time of the year to see this beauty in its full glory. But that’s ok, because coming from Washington, we have lots of spectacular waterfalls and pools at home. 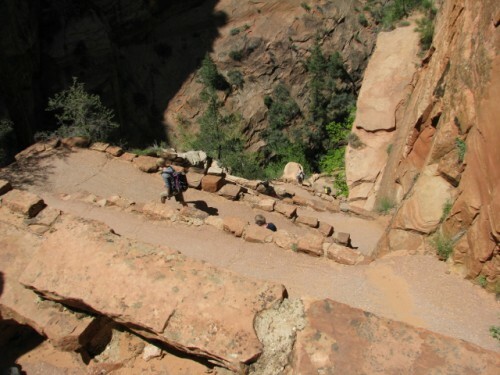 We didn’t go up to the second or third pool because we had already hiked about 6 miles at that point, but I was surprised to learn that more people have actually died falling from the Emerald Pools Trail than at Angels Landing. I guess you can’t let your guard down anywhere at Zion – who would have thought? 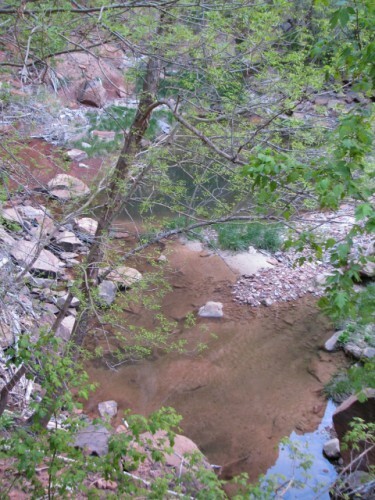 Once we got back from the mud puddle – er… pool – we got on the shuttle back to the Visitor’s Center, got our car, and headed over to the Kolob Canyons section of the park. This section is more wooded and not as visually dramatic as the main tourist section. As a result it was much quieter and less traveled. 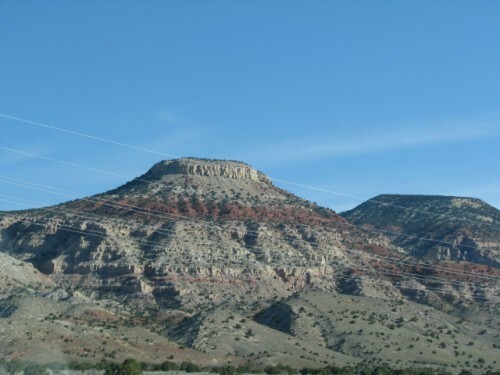 It does have the tallest mountain in the park though – Horse Ranch Mountain at an elevation of 8,726 feet. One of the guidebooks I read before the trip suggested a hike called the Taylor Creek Trail that leads you past two settler’s cabins from the 1930s. If we were doing another day in the park, we certainly would have checked out that trail. It is about 4 miles, and looked like a nice, moderately difficult hike. 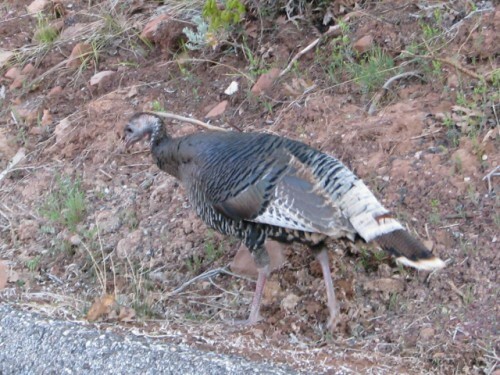 On our drive through Kolob Canyons, we even saw a wild turkey! She was just off the side of the road, but she was a little shy when I rolled down the window to get some photos, so the photo below was the best we could do. Kolob Canyons has a Visitor’s Center, but we got over there after it had closed for the day, so I don’t know if it has its own National Parks Passport stamp. I bet it does; they usually do. That just means I’ll have to come back! All in all, it was a fantastic day at Zion. We had perfect weather – the high was in the mid-60s, so it wasn’t too hot when we were hiking in the sun. I hated to leave. Our last bit of the day was spent traveling up to Cedar City (we stayed there instead of Springdale to get a jump on the next day’s driving) and we made our way to the next Super 8 of the trip. When we checked in, we discovered that there was a smoke detector in the room next door chirping – what is it with Super 8’s and smoke detectors? I probably don’t want to know. We had a few errands to run, so the clerk at the front desk told us that he would either fix it before we got back, or move us to another room. Then off we went to the only electronics store in town, Walmart, to see if we could get a new cord for our GPS, since ours was no longer charging the device. Kenny didn’t have a Garmin cord, but he was able to find us a universal adapter that fit into the Garmin’s mini USB port. It worked! And we were back in navigational business. Jon didn’t feel like eating dinner out, so we got deli sandwiches, snacks and fruit, and went looking for some beer and wine. This is when we discovered a quirk that we didn’t know about Utah and alcohol. Apparently, Utah does not permit sales of alcohol with higher than a 3.2% alcohol by weight in grocery stores or on taps in bars. Apparently you also have to order food at the same time as you order alcohol in a bar or restaurant. When we got back, our hotel clerk had successfully fixed the chirping smoke detector, so we were able to eat our dinner in peace and watch a bit of TV. Then it was off to bed for a good night’s sleep and another early morning wake up. 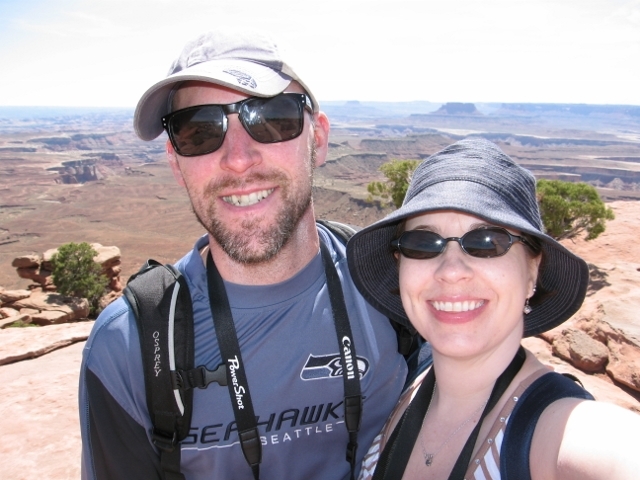 We were headed to Canyonlands the next day! Between March and October, visitors to the Zion Canyon section of Zion National Park are not permitted to drive into the Canyon. You can park at the visitor’s center, and get on one of several propane fueled shuttle buses that ferry visitors in the Canyon. This was implemented in the 1990s in an attempt to cut down on pollution and the effects of so many vehicles in this fragile ecosystem. The buses come along frequently, and were often standing room only. We took a bus out to the Grotto stop, which is where the Angels Landing hike begins. 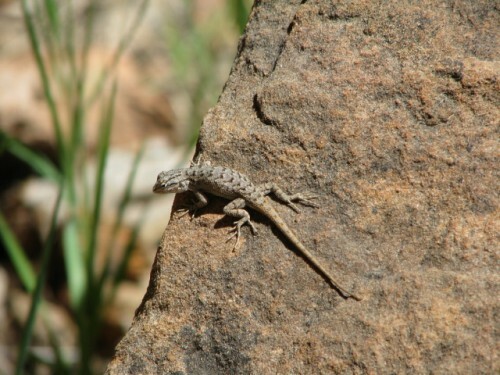 Who Could Resist this Little Guy on the Angel’s Landing Trail? 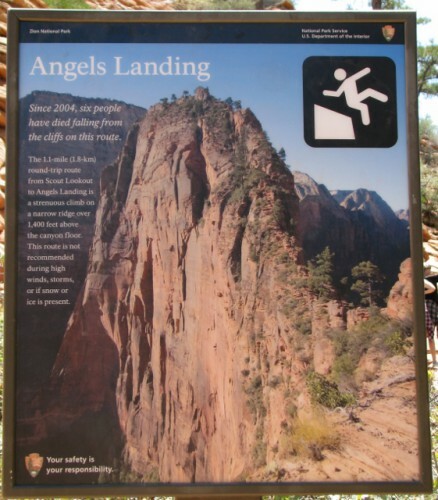 I had read about Angels Landing before we left on the trip and wanted to challenge my fear of heights. It is one of the most strenuous hikes in the park, with a round trip length of 5.4 miles up a mountain on switchbacks to the top, where you are rewarded with an amazing view of the canyon below. We hiked up an unpaved trail, which then becomes paved as the trail gets steeper. Then we hiked through Refrigerator Canyon, which is a shady area which often has a nice cooling breeze. The breeze was lovely when we got there, after getting hot and sweaty in the sun on the way up. Then we got to Walter’s Wiggles, which are a series of steep, paved switchbacks cut into the rock. Walter’s Wiggles are a series of 21 steep switchbacks that are named after the first superintendent of Zion National Park, who helped engineer the switchbacks. To be honest, I don’t remember there being 21 of them! After tackling Walter’s Wiggles, we made it to Scout Lookout, a beautiful area at the top of the rock. So, why did I want to try it? A couple of bloggers had written about hiking Angels Landing, young women like me who are fit but not super athletes, and they had both said that the hike was less scary than they had been expecting. So maybe it wasn’t so bad. After all, there were lots of people up there making the attempt the afternoon that we were there. Thousands hike Angels Landing each year, and live to tell about it. Many love the experience! We started out up the cliff, holding onto the ropes and putting our feet into the depressions of those who had gone before us. Based on the steps that have been worn into the sandstone over time, most of the adventurers were much taller than me, because there were some large spaces between steps. I got about 20 feet up the cliff, and then decided abruptly that this was not for me. I was getting really nervous, and this was just the beginning. I didn’t want to have a panic attack and find myself stuck on an exposed cliff. Not to mention, there would be lots of waiting in line to go up or down because of the numbers of people there that day. My fear of heights was not going to be conquered; at least not that day. I scrambled down and Jon came with me. He later told me that he could see it clearly on my face at the exact moment that I decided I was not up for the challenge – a look of doubt had washed over me and he knew I was going to turn around. He didn’t give me a hard time about changing my mind, but I knew he was disappointed because he did want to go to the top. After basking at Scout Lookout for a little while longer and talking to a woman – she had done the hike before and said that it just got worse from there – I felt better about my decision to not go. So, I didn’t succeed on this hike, but hey, sometimes that’s the way it is. Sometimes you find out what your limits are. Sometimes you find out that there are things that you just aren’t good at – things that just aren’t for you. And that’s ok. 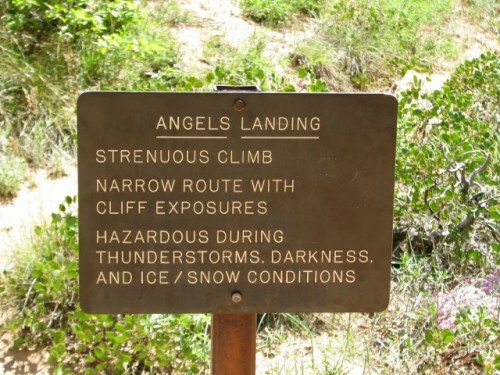 I can do lots of scary things – ride a bucking horse, speak in front of crowds, be brutally honest with a problem employee, but hiking Angels Landing is not one of them. That doesn’t mean that I will stop trying, stop testing my boundaries, stop challenging myself. 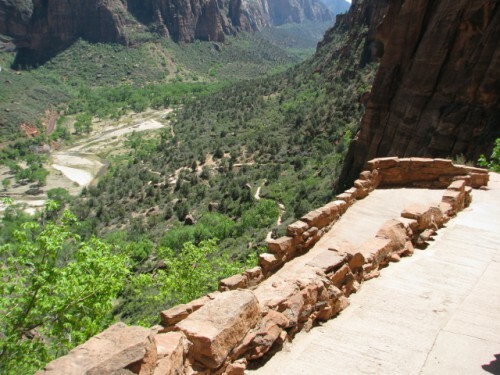 And who knows, maybe one day I will hike Angels Landing. 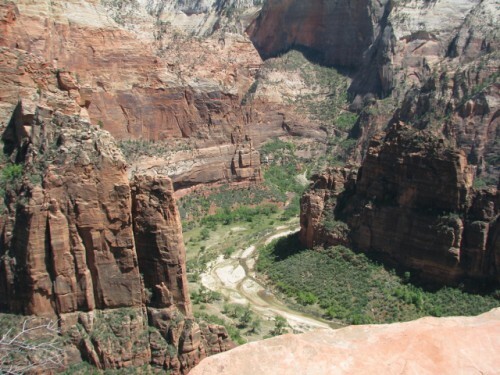 Have you ever hiked Angels Landing? Have you ever decided not to? Shortly before noon, we reached Springdale, Utah, the small town just outside of Zion National Park – the gateway to the park. They had lots of cute rock shops and places to sign up for tours and rent bikes and climbing equipment. They even have an IMAX Theater that shows IMAX movies on Zion. 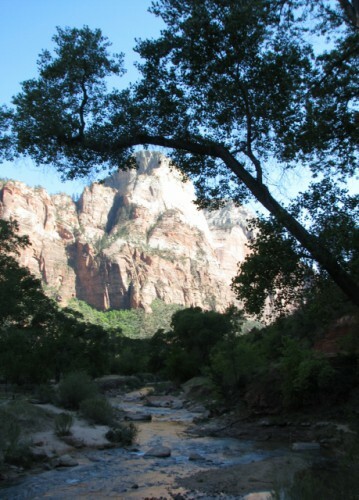 It would be a great place to spend some time, but we wanted to maximize our time in Zion National Park. The entrance fee for one car and its occupants for one week is $25, but since we were going to visit several parks during our vacation it made sense to buy an $80 annual pass. There are discounted or free passes for seniors, military personnel and disabled people too. We stopped by the Visitor Center and got my National Parks Passport stamp – the first of many for the trip! And, some postcards. Because a trip to a National Park Visitor Center wouldn’t be complete without postcards… they even had those cool wooden ones! Zion National Park began as Mukuntuweap National Monument in 1909, designated by proclamation of President William Howard Taft on July 31. At that time, the area was virtually inaccessible to tourists, as passable roads did not exist and the nearest rail line was nearly 100 miles away. Improvements were made to the roads to make the area more accessible, and tourists began to visit within a decade. 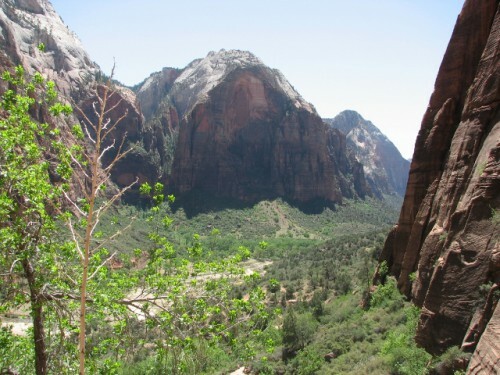 Zion’s designation as a National Park came on November 19, 1919; at that time the name was changed to Zion. It was believed at the time that tourists would not bother to visit a park with a Native American name they could not pronounce – it was a general bias at that time. 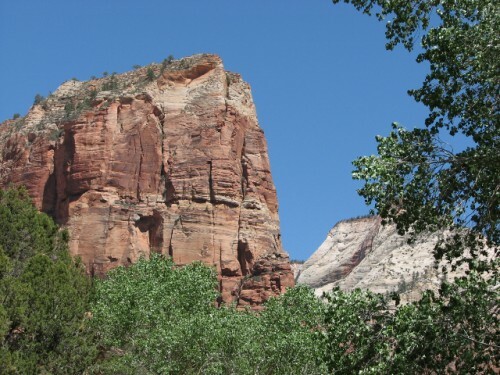 The Kolob Canyons section of the park was established as a separate National Monument – Zion National Monument – in 1937, but was incorporated into Zion National Park in 1956. The first human presence in the park was about 12,000 years ago; they hunted mammoth, camels and sloth in the area. When these large animals began to die off, they began hunting smaller mammals before gradually changing to a farming culture between 2,600 and 1,100 years ago. These Anasazi people, as they became known, had left the area by about 800 years ago, probably due to drought. The Paiute people moved to Zion shortly after and thrived. 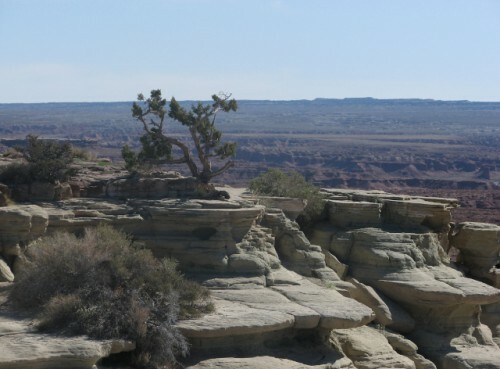 Mormon settlers arrived in 1847, and began farming the area – the Canyon floor was farmed until the park’s designation as a National Monument in 1909. The park has a significant elevation change within its boundaries, with the lowest point at Coal Pits Wash – elevation 3,666 feet and the highest point at the 8,726 foot Horse Ranch Mountain. 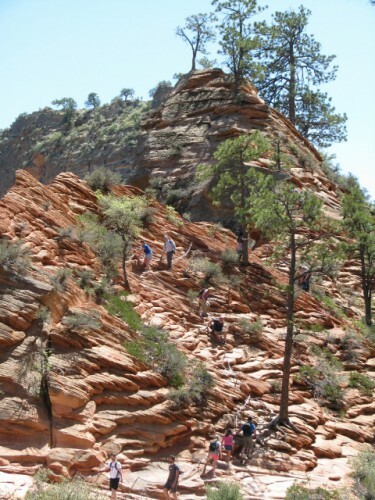 The park consists of several sections; the Zion Canyon area, the Kolob Terrace area, and the Kolob Canyons area. Zion Canyon is the most visited section; it is a 15 mile canyon on the North Fork of the Virgin River, and the canyon has depths of up to 1/2 mile. 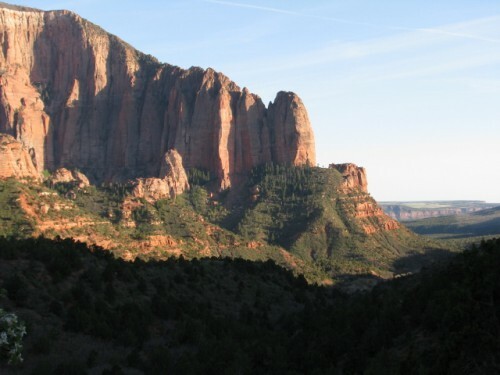 Horse Ranch Mountain is in the Kolob Canyons section of the park. One of the most popular features of the park is the Zion–Mount Carmel Highway, a scenic drive that provides a direct route from Zion National Park to both Bryce Canyon National Park and the North Rim of the Grand Canyon. 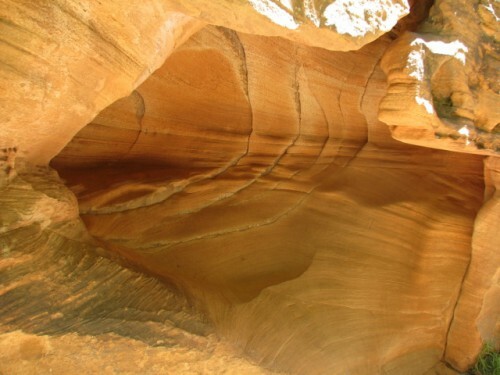 The highway has a 1.1 mile long tunnel carved through the sandstone. The tunnel was constructed beginning in the late 1920s and it was completed in 1930. It was placed on the National Register of Historic Places in 1987. You could spend days in the park, visiting the Human History Museum, hiking the numerous hikes within each section of the park; anywhere from 1/2 hour to 4 hours for each hike, driving the scenic highway, and just relaxing. I’m not a big fan of camping, but I think it would be pretty awesome to camp here. I’ll post next about our adventures at Zion!